Milk – and what it can be turned into – are integral not only to the Scottish diet, but also to our culinary heritage, writes Carine Seitz. Whether it’s in our afternoon coffee or morning bowl of cereal, most of us drink milk every day without giving it any thought beyond whether it’s fresh. But what is milk and where does it come from? Well, most commonly, cows. The characteristics of milk can vary depending on two things: the breed of cow, and the grass and other feed it consumes. Jersey and Guernsey cows produce milk with a particularly rich and creamy taste due to a higher level of butterfat. It has an almost yellow hue and is especially suitable for making cream and ice-cream. Brown Swiss cows’ milk has higher protein levels and is good for cheese. The majority of dairy cows in Scotland, however, are black and white Holstein Friesians or Ayrshires. The latter, deﬁned as a breed in the 1870s in south-west Scotland, are strong, rugged cattle with an ability to forage for themselves in poorer terrain and less favorable climatic conditions. These qualities, along with strong milk yields and generally good health, make the brown-and-white Ayrshires outstanding commercial cattle for Scottish dairy farms. It’s no coincidence that the largest producing Scottish farms are found in Dumfries & Galloway and Ayrshire, where rainfall levels are higher and the grass grows long and lush in the summers too damp for reliable grain production. In Scotland, the milk found in shops has been pasteurised to kill off harmful micro-organisms. This process involves heating the milk to 72C for 15 to 30 seconds and then cooling it rapidly (UHT is Ultra Heat Treated, giving it a longer shelf life). It is also often homogenised, when the milk undergoes a process that forces the milk through small holes at high pressure, breaking up the fat globules. This spreads the fat evenly throughout the milk and prevents a creamy layer forming at the top, resulting in a more uniform consistency and a whiter colour because the greater numbers of fat globules scatter the light more effectively. 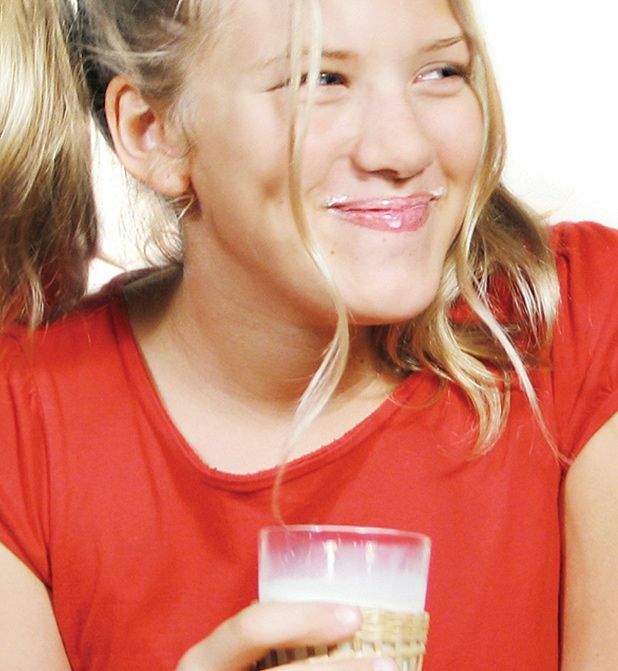 Some people drink milk in its raw form – untreated and essentially straight from the cow. It contains enzymes, higher concentrations of vitamins and probiotics and tastes richer and creamier than treated milk but it may contain bacteria such as salmonella. Since 1983 it has been illegal to sell unpasteurised milk in Scotland. Organic milk is produced from cows that have grazed on grass grown with no additional artiﬁcial pesticides, herbicides or fertilisers. Whole milk has nothing added or removed and, contrary to popular belief, is low in fat at around only 3.5 per cent. Skimmed has nearly all the fat removed, but consequently has lower levels of soluble vitamins, though conversely, slightly more calcium. With 2 per cent fat, semi-skimmed is the most popular milk in the UK. All dairy products start life as milk. There’s cream (produced by separating the fat from milk through centrifugation; the addition of bacterial culture produces crème fraîche and soured cream); butter (produced by churning cream); yoghurt (produced by live bacterial fermentation of milk with thicker yoghurts the result of separating the whey from the main curd); ice-cream (frozen sweetened custard most commonly made from cream, milk and egg yolk); and cheese, of which the varieties run into thousands. As an industry, however, Scottish dairies are under pressure. The latest ﬁgures collected by the Scottish Dairy Cattle Association show that there are only 1072 dairy farms left in Scotland, around a tenth of the ﬁgure 50 years ago. The National Farmers Union also estimates that farmers can often lose money on every litre of milk they sell to supermarkets – so why do they do it? Dairy farming is a hard-working, traditional way of life. It is a skill passed down through generations: many farmers’ fathers did it, and their fathers before them. Dairy products – milk, cream and artisan cheeses – are as much an integral part of our Scottish culinary heritage as seafood, game and beef.